Welcome to The Bud Crew blog! We are * Kevin Flach * Jerry Glynn * Rich Lewicki * Mike Redlich * and we've been a team since 1977. We hope you enjoy your visit. On the weekend of November 10-11, we had a Bud Crew Weekend at Jerry's house in Lehman, Pennsylvania. We were finally able to have all four of us in the same room at the same time! It was great catching up on old times and, of course, new ones! Kevin brought along a photo album containing pictures from various parties and events that spanned almost 30 years! It was great seeing these again! We were supposed to go to a shooting range, but as it turned out, we wound up laughing about old times, drinking plenty of Sam Adams and other micro-brews, and watching Springsteen concert DVDs. I believe we all finally turned in around 2:00am. That was about 12 hours of drinking! Not bad for a bunch of old men, eh? We vowed to do more of these. But, it's challenging with Kevin in Delaware, Rich in Connecticut, Jerry in Pennsylvania, and myself in New Jersey. At least we are living withing a few hours drive from each other. 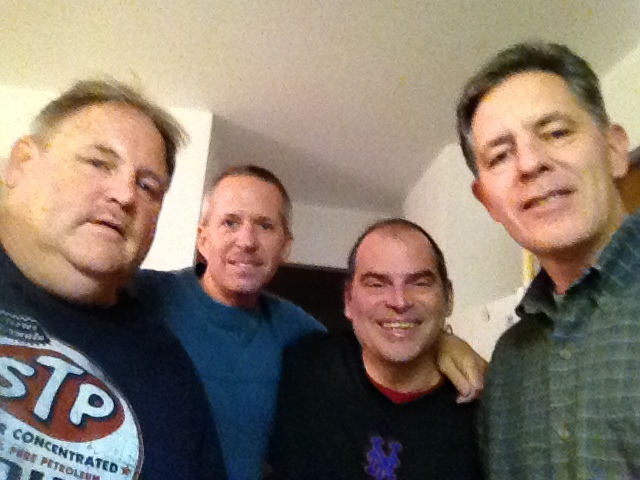 In the attached photo, the Bud Crew is, from left to right, Jerry, Kevin, Mike (that's me), and Rich.